Bedouins are living all over the Arabian peninsula, Syria, Jordan, Egypt and Libya. The Sinai Bedu are split in roughly 10 tribes. The oldest tribes inhabiting the Sinai desert are the Aleigat and the Sawalha sharing a territory between Suez and Al Tor reaching into the high mountain region around Wadi Feiran and Sarabit el Khadem. For the last 500 years the Muzeina tribe occupies the territory from around St. Catherine to the Gulf of Suez and from Al Tor covering the southern Sinai from Sharm el Sheikh to Nuweiba. The Tarabin Bedouins are located just north of Nuweiba and arrived to Sinai some 300 years ago. An exception among the Bedouin tribes in Sinai is the Gebeliya tribe. As the word "mountaineers" indicates this tribe lives in the high mountains of St. Catherine. Originally they came from Eastern Europe (most likely Yugoslavia) to serve in the monastery of St. Catherine. Soon they converted to Islam and adapted to nomadic customs, though still serving the monastery to which they are committed until today. Naturally the Gebeliya tribe is hold of low esteem not being of true Bedu origin. Only few Bedouins live as their forefathers did in camel- or goat-hair tents (house of hair), raising livestock, hunting and raiding. Most Bedouins of the Sinai are going through dramatic changes and are forced to rapidly adapt to a new way of life due to the impact of tourism. Yet, ever since the rise of Islam Bedouins were already acting as 'tourist" guides, leading pilgrims to places of worship: Mecca, St. Catherine and Jerusalem crossing the Sinai on the Darb el Hajj (the pilgrim's road). The clan organization is the basis of Bedouin society until today. Every tent represents a family; every camp makes up a clan. A number of kindred clans make a tribe. All members of the same clan consider each other as of one blood and superior. The tent and its few household contents are individual property, while water and pasturage are tribal property. The spirit of the clan demands unconditional loyalty to fellow clansmen. The society in which he lives levels everything down. The strong belief in his tribal superiority and in return the tribal security gave him the support to survive in hostile environment. The clan is represented by a Sheikh, chosen by the tribe members. He is not an absolute authority since in major affairs he must consult with the tribal council. The Bedouin in fact is a born democrat. He meets his sheikh on equal base. No wonder that discipline and respect for order and authority are not among his ideals. The Bedouin woman enjoys the freedom choosing a husband. Divorce is common among Bedouins and encompasses no social stigma. She lives in a polygamous family in a patriarchic system, in which the man is the master. Nevertheless she is at liberty. Considering the sometimes long absence of her husband and other male family members she is the master of her and her family's lives. As much as she seems to be controlled by social norms she is in return is protected by a Bedouin law system that counts any misbehavior against her double to 4 times the punishment awaiting a man under similar circumstances. Blood calls for blood. If a member of a clan commits murder inside the clan, nobody will defend him. In case of escape he becomes an outlaw. No worse tragedy could happen to a Bedouin than the loss of tribal protection. A Bedouin without the protection and security of his tribe is helpless and lost in the desert. If the murder is outside the clan, a vendetta is established, and any fellow clan member may have to pay for the crime with his own life. A blood feud may last for many years. The Bedouin law system is tough as is the desert life. Yet, what can result in a blood feud can be solved in terms of paying blood money or even in forgiveness for the greater good. Every case may it be an insult or a murder is discussed by family and clan members, before it goes to the court of elders where a final judgment is founded on a comprehensive discussion of the matter which can often last for days or even months. Empires have come and gone, but the Bedouin has remained forever the same - is a romantic ideal of many foreigners. 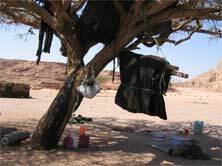 The Bedouin of Sinai have changed in order to adapt and survive in the radically changing world around them, that may be harsher and more hostile then what they have known before. Today the Bedouin settlers in the coastal towns long for tranquility of the desert where they often return to for retreat from a demanding modern life. Agriculture was beneath dignity and against his independent lifestyle. Indeed, the arid desert has not much fertile land to offer for agricultural efforts. With the process of settling and integrating themselves into the tourism business Bedouins have also started to cultivate gardens all over Sinai, where they grow vegetables and fruits, but mainly date palms. Once he lived on a diet of dates, milk and fish and on special occasions goat or sheep meat. Despite his sparse and monotone diet and active life style his life expectation and health condition were exceptional. Today a lazy western life style in front of TV sets, driving a car rather than walking the distances have demanded tribute. An overly rich and various diet has lead to common disorders as diabetes, heart and liver diseases and even rheumatism once unknown among the Bedouins. The hostile desert environment did not only lead to a total dependency between the individual and the clan and to chauvinistic beliefs of the tribe's superiority, it also obliged to a fabulous hospitality towards other desert travelers. A complete stranger could stay for as long as three days without being asked of his whereabouts. He was considered and treated as a guest and enjoyed the clan's full protection. Today this has changed and for the obligatory cup of tea payment is expected. Too often tourists took advantage of legendary Bedouin hospitality on one side or on the other by patronizing the "poor" Bedouins by paying and overpaying a simple cup of tea and beyond. When once the stranger was invited for as long as three full days to be a guest, today the stranger pays for what the Bedouin has to offer right from the start, may it be a cup of tea, or a shelter or a camel trek. However, hospitality is in the blood of the Bedu and wherever one meets with Bedouins of the Sinai the most amazing and lasting experience is exactly this: warmth and kindness. Of the animals the camel is the best. It was the nomad's vehicle of transportation and his medium of exchange. The dowry of the bride, the price of blood were estimated in terms of camels. It is the Bedouin's constant companion. He drinks its milk; he feasts on its flesh; he covers himself with its skin; he makes his tent of its hair. Its dung is used as fuel. It is his shelter in the cold winter nights and protector against sandstorms. To him the camel is more than "the ship of the desert"; it is the special gift of Allah: Ata' Allah. Though the camel is exchanged for the 4 wheel drive or the pick up, it still plays an important role in terms of wealth. Camels are used for breeding, trained for racing and carrying tourists on camel treks, one of the main sources of income as Sinai's economy is mainly based on tourism.